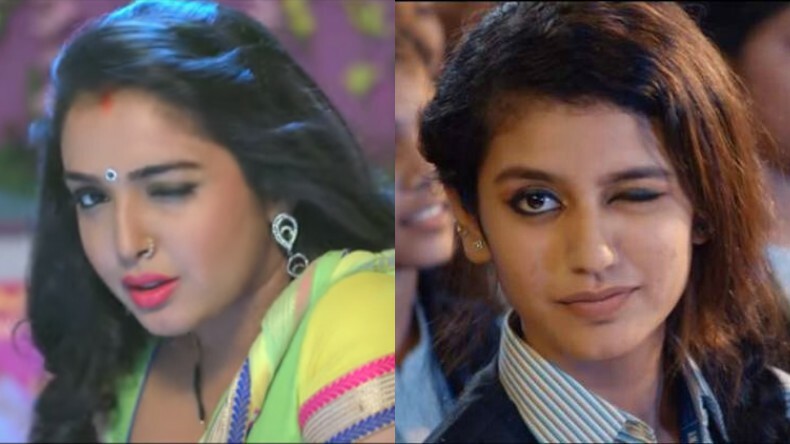 Winking sensation Priya Prakash Varrier took the entire country with a storm with her iconic wink act in the song Manikya Malaraya Poovi song from her debut film Oru Adaar Love. However, she is not the original wink girl. Much before Priya, Bhojpuri star Amrapali Dubey had raced many hearts with her wink in the song titled Matha Fail Ho Gail from the film Raja Babu opposite Nirahua. Malayalam actress Priya Prakash Varrier paved her way into million hearts with her wink act in Manikya Malaraya Poovi song from the film Oru Adaar Love. From garnering more than 60 million views on the music video to the increasing numbers of followers on her Instagram account, Priya was deemed was the ‘national crush of India.’ However, she was not the first one to start the wink trend. Much before the song release, Bhojpuri star Amrapali Dubey had raced many hearts with her wink act in the song titled Matha Fail Ho Gail from Raja Babu. In the song, Amrapali Dubey can be seen seducing her co-star Dinesh Lal Yadav aka Nirahua. Just like Priya’s iconic wink, Amrapali had made quite a buzz with her sultry expressions in the music video. Before venturing into the film industry, the diva had featured in TV shows Rehna Hai Teri Palkon Ki Chhaon Me, Saat Phere, Maayka and Meri Naam Karegi Roshan. She had made her big screen debut with the film Nirahua Hindustani opposite Nirahua. Amrapali and Nirahua are one the most loved and adored on-screen couples of Bhojpuri cinema. On the other hand, Oru Adaar Love starring Priya Prakash Varrier, Siyadh Shajahan, Roshan Abdul Rahoof, and Noorin Shereef will hit the screens on June 14, 2018. Reacting to the immense appreciation and love that the diva received, she had earlier said, “It happened spontaneously. This is my debut film and the director just asked me to give expressions and it just went viral.” The 18 year-old had also revealed that she has received film offers from Malayalam, Tamil and Bollywood film industry but she has not accepted any of them yet.